In collaboration with GL Hearn Baca were asked to look into the potential for the future expansion opportunities to support the growth of the West Sussex town of Littlehampton. Baca carried out initial feasibility studies on over 30 sites to determine the most suitable opportunities. From the 30 sites 8 sites were considered potentially suitable to deliver the 1000 home strategic objective of the Littlehampton Economic Growth Area. Following identification of suitable sites a coordinated and integrated strategy was implemented to create sustainable development and infrastructure able to support the economic growth targets. 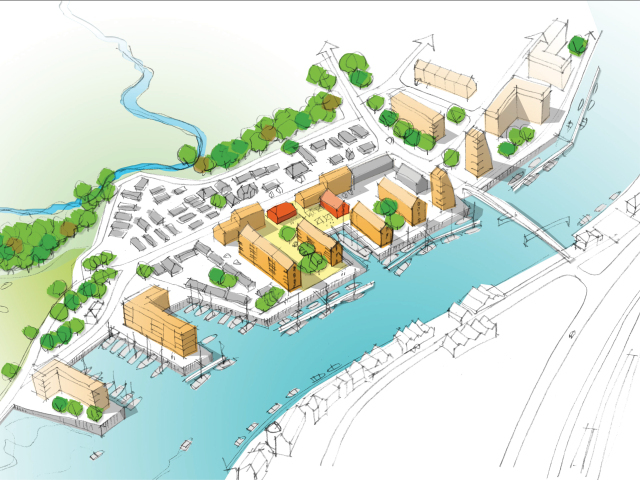 Due to the potential for flooding in and around Littlehampton Baca Architects strategic specialism in flood mitigation solutions to create safe new development was drawn on to provide a coherent and feasible framework for future development. The new development will not be fully defended and Makes Space for Water by retaining effective flood plain across the site where suitable. The proposals include flood resilient homes, flats over car parking that will be allowed to flood in extreme flood events and elevated mixed-use schemes.